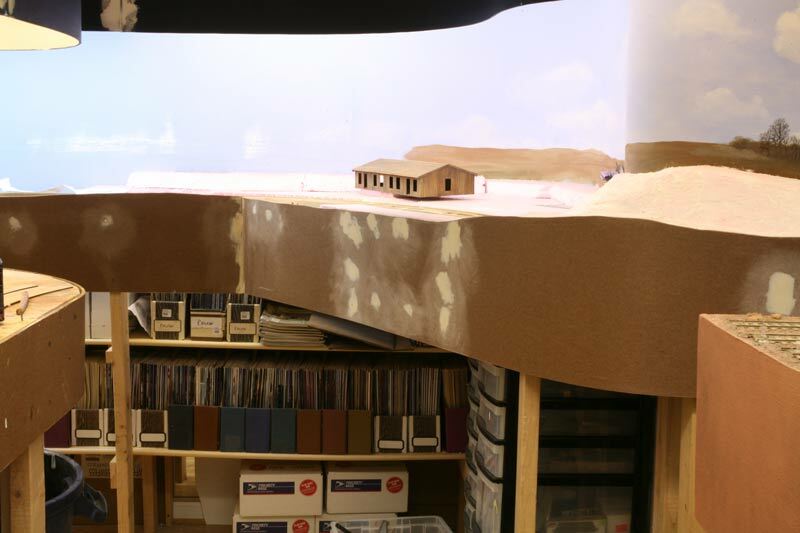 Here are some views of the Stoneman's Switch (or station) area of the layout. This is one of the deeper scenes on the layout. The backdrop images are intentionally small to show more perspective. There will be good opportunities to use smaller scale figures and details to convey distance. The striped pieces of wood are some of the laser-cut 1/8th inch aspen plywood roadbed sections. The southern end of Stoneman's Switch cuts through a small hill. The backdrop treatment of the hill was tricky. I used a section of Brian's artwork with some hand painting to integrate the hill into the Stoneman's scene. This is the southern side of the hill. One of the things I wanted to achieve with the backdrop is to show some "vacant" countryside in between the Union army camps. During the winter military units camped all along the line, but even a 100,000 man army would not have a line of camps 13 miles long. So the scene between Falmouth and Stonemans will be one of these. However, there will be a small camp scene with Union pickets guarding the bridge over Clairborne's Run. I haven't decided if I'll include a blockhouse or not. Right now I am leaning toward only having some rifle pits and not a blockhouse. I have been painting tree stumps on the backdrop since the soldiers frequently cut down the trees for firewood and winter cabins. They also used fence rails, barns and other sources of wood for their needs. I recently learned that after the war, citizens could file claims for such damage if they were "loyal to the Union" during the war. I wonder how many claims were actually paid. I devoted my layout work this weekend towards backdrops. I was able to complete the backdrops from Falmouth to Stoneman's Switch. I used several pieces of Brian Kamerer's art composited with my painted skies and background painting. I used Photoshop to resize and move elements around to best fit the intended location. Then I printed sections of Brian's art sections on my 13x17 inch Epson 1400 printer. I cut out the scenes, touched them up as needed with pen or paint and glued them to the backdrop using spray adhesive. 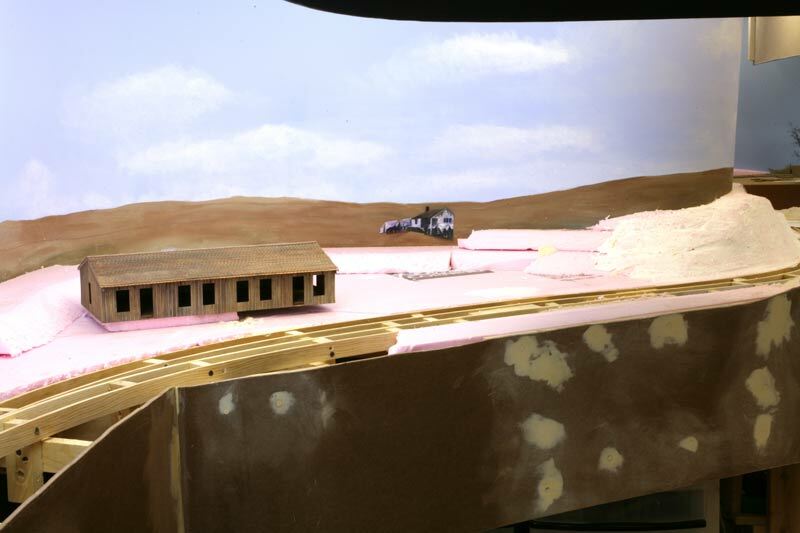 In some cases I used acrylics to paint the scenes surrounding the cut-outs to make them fit. Overall, I think it worked out very well and the redone backdrop behind looks good. I also like the way the creek bed and hill by Stonemans came out. Brian's art is full of intricate detail with many soldiers, horses and wagons that would be tedious and difficult for me to paint. Many thanks to Brian for letting me use his art. This is a view of the freight house in its new location at Stoneman's Switch. That is spline roadbed in the foreground. I am trying to get the backdrops done before proceeding with track and finished scenery. However, I am roughing in the terrain forms before putting down the track. It seems more logical to me this way. The brakeman's view. A shot with the iPhone resting on the deck of a flat car - just for fun. Rob had one more night in town so he continued to make trees. Thanks to his 5 new pines, the layout now has double its inventory of trees. The latest is a particularly impressive double trunk, mature pine with a carved nebari. We'll have to make sure all the trees have similar root structure. 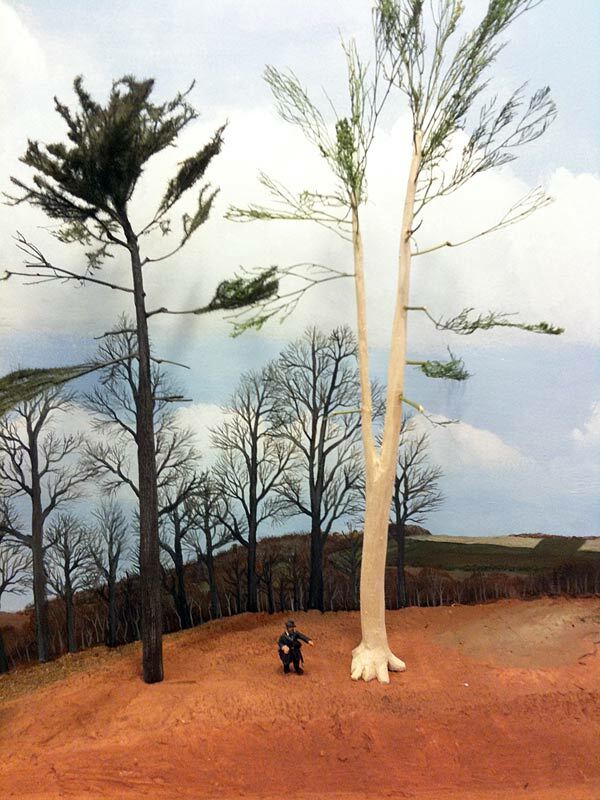 The figure standing next to the tree gives a sense of the size. It is a 40mm ACW figure that stands about 1.7 inches tall. I continued to paint the backdrops. Tonight I added Lacy House (now known as Chatham House, a National Park Site). The house on the backdrop is a colorized cutout from a photo of the actual Lacy House overlooking Fredericksburg. I painted a large splotchy grassy lawn surrounding the house since it was the estate of a wealthy Virginian that has been trampled by thousands of Union soldiers. The Union doctors used the house as a hospital after the battle of Fredericksburg. Over 100 soldiers were buried on the grounds (most were later moved to the National Cemetery). Before the war the estate had many out buildings and lush forests. Union soldiers cut most of the trees for firewood. They even stripped some of the wood paneling for fuel. The few period photos of Lacy House do not show any out buildings near the main house, so I placed it alone on the hill. The foreground scenery will eventually also get some grass ground cover, so hopefully the colors will match. This is the colorized photo of Lacy House from the 1863 time period. I colorized it in Photoshop, but had to add some acrylic paint to increase saturation to match the rest of the backdrop. The colorized print was too unsaturated. I am undecided on how to proceed with painting the rest of the Falmouth backdrop. Should I continue the distant scene or have a more detailed, closer representation like I had with the computer printed backdrop? I may try the former and see how it goes. The beauty of had painting is I can change if i decide it's not working. Here is a video that shows the operation of the stub turnouts on my layout. One of the advantages of having a brother who is a world renowned expert in the art of bonsai trees is having him help you make trees for your layout. He is on a business trip this week to Virginia, so I put him to work making model trees for the layout. He made two yellow pines. One an immature tree to match the trees on the backdrop. The other a larger specimen. Yellow Pine is a term for several closely related species of pine with yellow tinted wood, including the Southern Yellow Pines (Loblolly Pine, Slash Pine, Shortleaf Pine, etc. ), and the non-Southern yellow pines (Ponderosa Pine, Jeffrey Pine, etc.) and several others. More than one of these species may occur at any one site, with the term 'yellow pine forests' typically used in forestry and ecology to describe such forests or stands that contain more than one of these species. 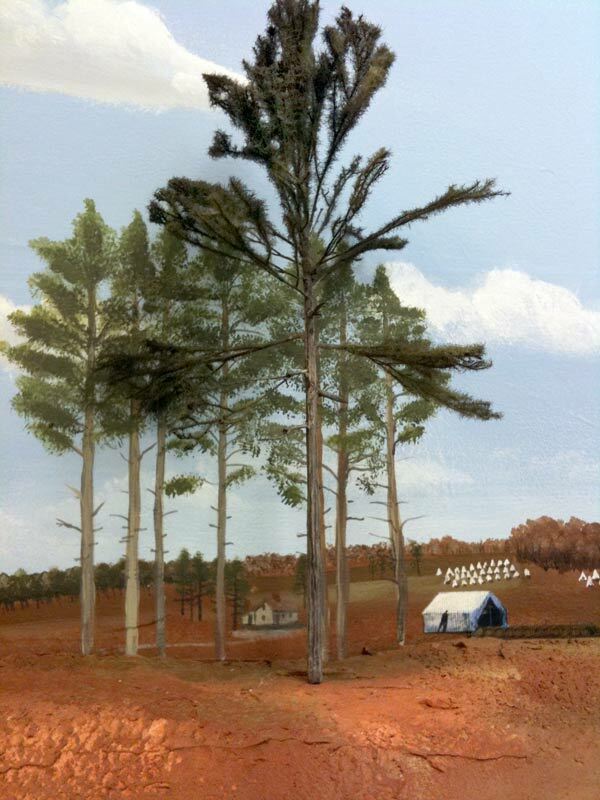 In the area of Virginia I am modeling Shortleaf and Loblolly Pine are quite common. The models use carved wood trunks from either balsa or basswood. The trunks should taper toward the top, with a bulge for nebari at the base. Nebari means exposed roots in Japanese. We will add the roots once the trees are installed on the layout. The trunk gets textured with a rasp to create the bark. Yellow pines can have a tall thin trunks with a crown of limbs at the top. The lower branches self prune. The branches are pieces of caspia that are inserted in holes drilled in the trunks. We use CAA to hold the branches. Some wood putty is useful in shaping the branches. The jin are the dead branches at the lower section of the tree. The jin have a detectable tapper. Once the branches are in place, we insert a nail in the bottom to act as a means to secure the tree to the scenery. They they get a spray coat of black and flat brown paint. Once the spray paint is dry, we dry-brush the trunks with a medium gray with some brown mixed in. The needles are static grass applied with hairspray. Multiple coats does the trick. The final step is to paint the needles with a light spray of conifer green. 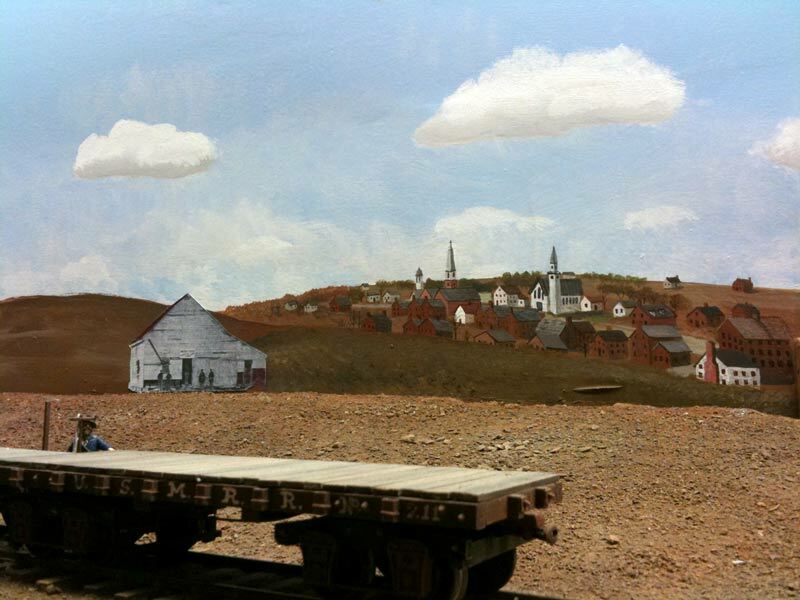 I painted a representation of Fredericksburg on the backdrop behind Falmouth tonight. I took a little liberty with the geography as one cannot see Fredericksburg from the railroad location at Falmouth, as the railroad is located at the bottom of a small ravine. Fredericksburg is on the other side of the hill and across the RappahannockRiver. Nonetheless, I thought that adding the town scene might help improve the overall layout context. The large barn-turned-church is a cutout of an ACW photo. This is just a test to see how it looks. I printed this on light weight paper. If I decide to use it, I'll reprint on heavy stock. I'll also use photoshop to colorize the image. For this test I just used some color markers. After thinking about the issue, I decided today to repaint the section of backdrop behind Falmouth. This section had a backdrop made using computer printed vinyl. While it looked great, I could not figure out how to proceed with it on the rest of the layout to have it match, etc. as I discussed earlier. So I painted over it. I tried removing the vinyl by peeling it off, but it was very solidly attached. It actually was ripping the paint off the surface underneath. So, I left most of it on, and painted over it with two coats of Kilz Primer and then two coats of sky blue. I painted some clouds and the basic horizon line. I started to added some detail, using some of Brian Kammerer's artwork as cut-outs attached with glue. More of that work remains. One of the key changes on the new backdrop is the lower horizon. This is oriented toward a track level versus birds eye view of the scene. The difference can be seen in the two sample photos here. The top photo is the design view point, while the second photo is the birds eye. I think the track level view is much more realistic. In studying photos of the area, I concluded that southern yellow pine trees were quite prevalent in the area I am modeling. So I took a crack at modeling them and painting them on the backdrop. I had been focusing on deciduous trees heretofore. 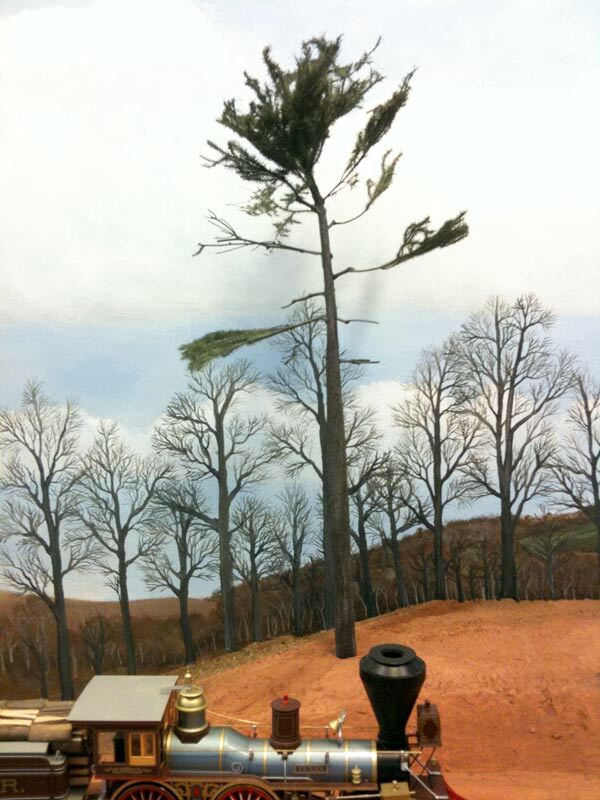 The tree in the foreground is an armature for a model pine. The next step will be to add dark green static grass to simulate the pine needles. On the backdrop are some quite large deciduous trees. I like the way they came out. This tree on the left has the needles applied. This tree is about 16 inches tall, or about 64 scale feet tall. Work continues on painting backdrops, fascia and scenery. I am using a textured paint from the Ralph Lauren River Rock line. The color is called Adirondack Bark- strange name for a color that resembles red Virginia Clay. The paint has a fine black sand added to it, giving a slightly rough texture to the surface. I am using it on the fascia and as a scenery base coat. As I paint the backdrop, I apply washes of acrylic craft colors to the scenery surface to help the colors blend. Most of this color will be hidden under a layer of applied scenery materials when I get to that phase. Chard's book is helpful in providing guidance on showing perspective for backdrop scenes. Just visible on the horizon in the second photo is a set of three field guns. These models are 25mm scale (1/64th) and are a test of forced perspective. They are hard to see in this shot as they blend with the distant ridge line. I think I can use 25mm figures in the deep scenes to help fill up the layout with detail. There is a wide variety of 25mm ACW figures and accessories available for the wargame market. Ideally, I would have preferred to do the layout in 1/64th scale, but the locomotives were not available. The third photos shows my first attempt at painting a structure on the backdrop. In this case a small farmhouse. There is also a faint path leading off to the distance. I'll probably install a fence along the backdrop-scenery joint to help disguise it. I planted some trees to see how they work with the backdrop. I painted some larger trees on the backdrop right behind the trees to help flesh out the forest that lies along the bottom of this creek. This is important in the larger scales on a shelf layout. Model trees take up a lot of room in this scale, so there is not a lot of space to simulate a convincing forest in the 8 to 12 inches between the track and the backdrop. I am getting close to the point where I need to build the first bridge. I plan to install the bridge before I lay the track. I do not plan to use a temporary bridge, but I may change my mind as things progress. It seems to me that a temporary bridge is extra work, and may make installing the final model bridge more difficult. I plan to install a wood trestle here, though my brother was advocating a model of one of Haupt's pre-fabricated Shad Belly trusses. Nothing like a three day weekend to make some progress on the layout, even if one day was our wedding anniversary. I decided that it was time to finish the benchwork, install the remainder of the fascia and, after consultations with Alicia and Dave Emery, relocate the valance. Photo at Left: Dave Emery is helping relocate the valance. The former location of the valance is visible on the ceiling. The original valance protruded into the center of the room to accommodate the benchwork of the previous layout, one that was based on some of my existing oNeTRAK modules. The upshot was that the valance was in the way, made the room claustrophobic and presented a head strike hazard. The line showing the location of the old valance is visible on the ceiling in the photo at the left. Once I decided to move it, it was a rather simple job. Dave Emery arrived just in time to be an invaluable help in relocating it. Moving the lights and patching the nail holes was not that hard. The relocated valance is great. Combined with the new benchwork, the center aisle is now much more roomy. 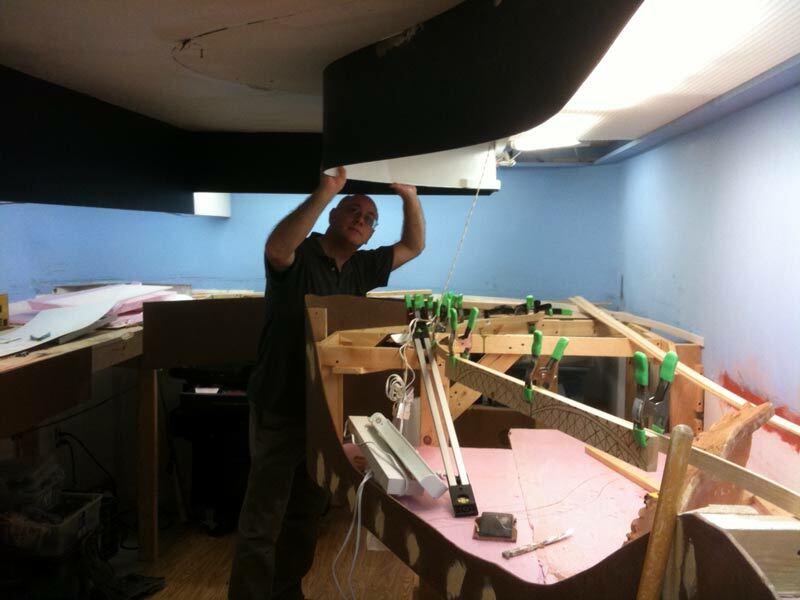 BTW Dave is working on his own Early Rail HO layout. You can see it here. This photo shows the deep fascia installed at the Potomac Creek location. 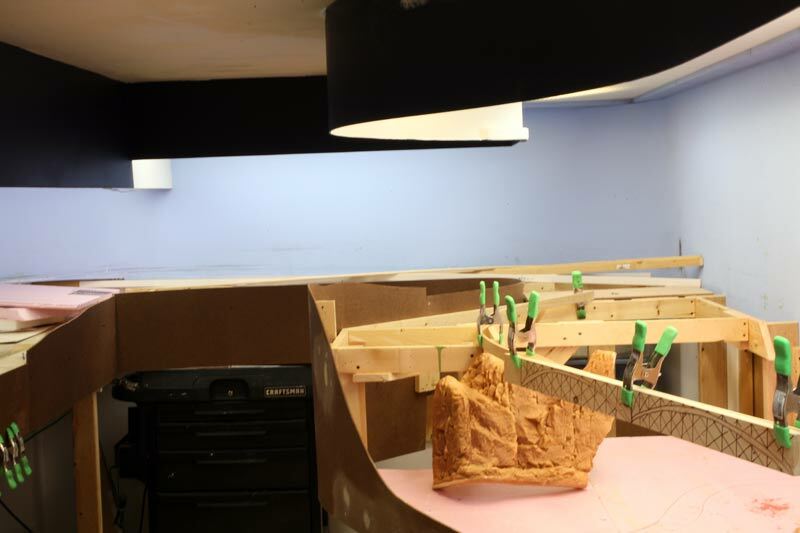 The completed fascia is visible at the far end of the layout room. The north end of the bridge is the narrowest point of the center aisle. The aisle is about 36 inches wide that choke point. 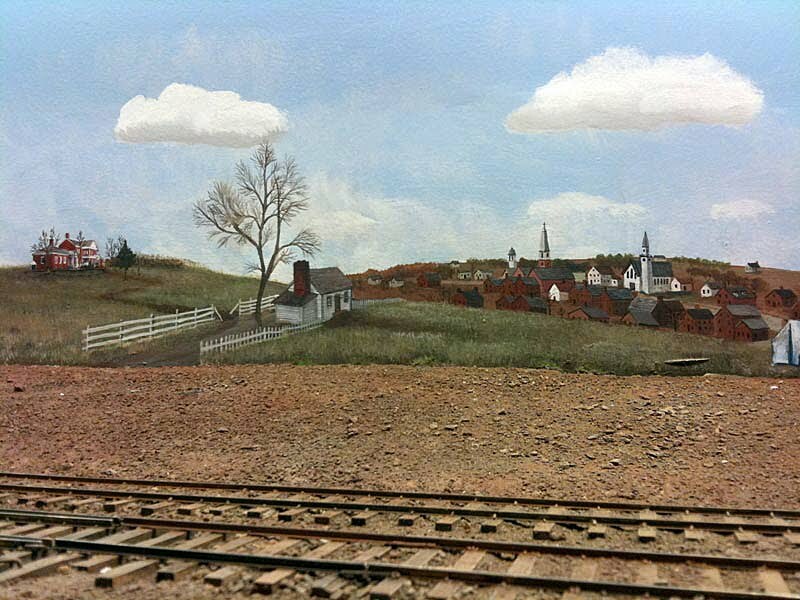 The horizon painted on the backdrop at Stoneman's Station will be adjusted from this photo to be about 3 inches lower. That is one of the advantages of hand painting backdrops, adjustments are easy. of "Fast and Final" patching putty. 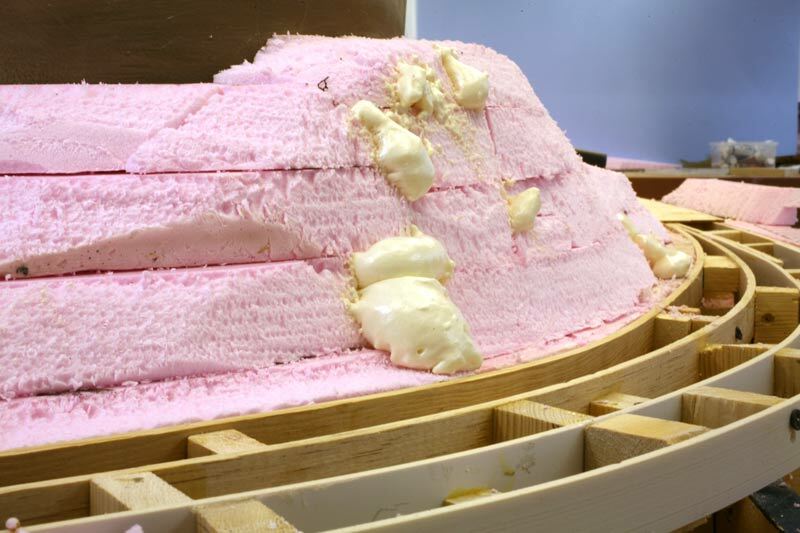 This particular putty works well with pink foam. It allows trees and other scenery items to penetrate without crumbling. One this dries, a coat of paint will go a long way to making it look like something. This will be the view greeting people as they walk into the layout room. I never really understood this poem, but when I see the winter sunlight I think of the first stanza. I always liked the late fall season, before the snows come, and the early spring before the flowers bloom. 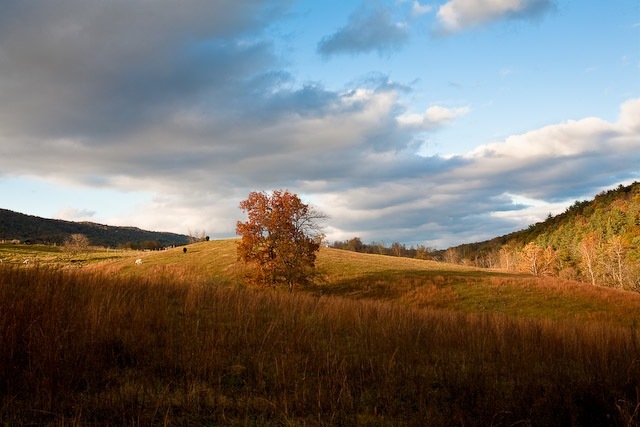 I like the color palette that arises from the browns, muted greens and dried grass tan viewed through the crisp air. Here are some sample shots that I found on-line that typify the look I am going for. For an interesting example of how seasonal lighting affects a scene see the Sauter's Delight Blog. 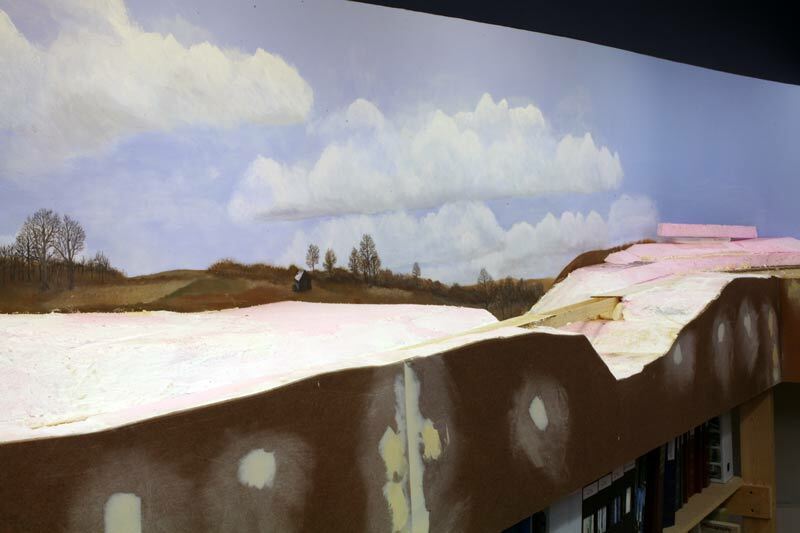 Work continued on the backdrop and hill scenery in front of it. One of the advantages of hand painting the backdrop is that I can make changes or modifications easily. As I install the terrain for the hill between the tracks and the backdrops, I see that I may need to repaint small sect ions to better integrate the hill with the backdrop. This is easy to do with hand painted scenes. You can also see how the clouds formations have smoother color blending thanks to using oil paints. The acrylic paints dry so fast that it can be hard to blend the color transitions. To feather acrylic paints takes multiple layers of very dilute paint, called a wash. This is made more difficult by the vertical nature of the backdrop, as the dilute paint forms drops that can run down. Oil paints are much easier to blend. I am using water soluble oil paints that do not require mineral spirits to thin. They are very handy. They dry a little quicker than normal oil paints too. These two photos show close up views of the backdrop. The building is a paper cut out from Brian's artwork. This one is just secured with a piece of masking tape. When I go final I will use double sided adhesive film. I can print these at various sizes and shades to fit into the scene. I think they will save a lot of time. There are two books I found useful in preparing me to paint backdrops. The first is "Landscape Illusion" by Daniel Chard. 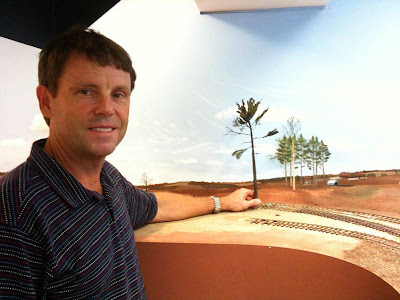 The style and techniques he presents are very useful in applying to model railroad backdrop painting. The other is "Acrylic Landscape Painting" by Hugh Green. This book is a more general purpose discussion of using acrylic paints in landscape scenes. I haven't personnally seen Mike Danneman's new book, but his backdrops are some of the best I have ever seen.